Since 2010, the permanent collection of the museum of customs and excise is located on the third floor of the Finance centre "Noordster" in the Ellermanstraat 21, 2060 Antwerp. In addition, we have a warehouse and a documentation centre on another location within the Scheldt metropolis. We want to start a vivid dialogue with colleagues and the broad public that is built on a scientific basis and that regards the place that the General administration of customs and excise is taking and the view on this administration, both now and in the past. By means of the museum and the documentation centre, our association wants to contribute to the building of a correct image of this administration and to emphasize its unique role in protecting society and safeguarding welfare. A long road has been walked by the members of the association for the National museum of customs and excise. Before the second World War already, it was suggested to found a museum of customs and excise by analogy with the "Tax museum" of Prof. Dr. J. Van der Poel in Rotterdam. Various directors-general of customs and excise approved the idea and published official letters on that subject, but the actual result always became stuck in the pipeline. The first step was finally taken thanks to the perseverance of Jan Hellinx, general editor of the staff magazine "De Schakel", who kept hammering on the need of an own museum, and under the inspiring leadership of the regional director of customs and excise in Antwerp, Marcel Buyst. In 1986, a museum committee was formed and an unincorporated association was founded. By appealing all Flemish directions and through publicity in its own periodical "D.A.-Museumnieuws" and other media, an innumerable amount of objects, documents, images, customs uniforms and other things rolled in. The Museum of customs and excise officially opened on 27 October 1988. It was through the boundless efforts of many volunteers that a room on the first floor of the Customs and excise centre located at Kattendijkdok O.K. 22 in Antwerp, became a museum. Four years later, the expanding collection moved to the ground floor. In 1993, the museum was a founding member - and still is one of the driving forces - of the“International Association of Customs/Tax Museums”, the alliance between 25 customs and tax museums in Europe and beyond. 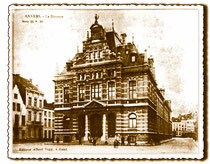 In 1996, the former ministry of Finance recognized it as the “National Museum and Archive of Customs and Excise” NPA having its seat in Antwerp.